In 1934, after the death of German President Paul von Hindenburg, Chancellor Adolf Hitler became the absolute dictator of Germany under the title Fuhrer or “Leader”. He ruled Germany with an iron until he committed suicide in 1945 as the Russian army closed in on Berlin. The German army took an oath of allegiance to its new commander-in-chief, and the last remnants of Germany’s democratic government were dismantled to make way for Hitler’s Third Reich. The Fuhrer assured his people that the Third Reich would last for at least thousand years. However, the National Socialist Party's Germany collapsed just 11 years later. Adolf Hitler was born in Braunau am Inn, Austria, on 20 April 1889. As a young man, he aspired to become a renowned painter, but he received little public recognition and had to live in poverty in Vienna. He wished to study art but failed to secure entry to the Academy of Fine Arts, since he had not obtained even a secondary school diploma. Unsurprisingly, during the next few years, Hitler lived a lonely, insecure and isolated life in poverty, earning a precarious livelihood by painting postcards and advertisements and often drifting from one municipal hostel to another. 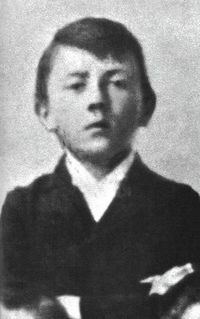 By that time, young Adolf had already shown traits that characterized his later life: features as loneliness and secretiveness, hatred of cosmopolitism, and last but not least - intense dislike for the multinational and multicultural character of Vienna. Hitler was also drafted for Austrian military service but was not accepted due to lack of fitness. In 1913, Hitler moved to Munich. At the outbreak of World War I, he volunteered to serve in the Bavarian army. He was accepted in August 1914 and received special permission to enlist as a German soldier and a member of the 16th Bavarian Reserve Infantry Regiment, though he was still an Austrian citizen. Despite the fact that Hitler spent much of his time away from the front lines, he was still present at a number of significant battles - Hitler managed to take part and was wounded in some of the fiercest struggles of the war. He was decorated for bravery, receiving the Iron Cross First Class and the Black Wound Badge. 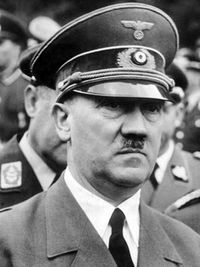 After World War I, Hitler returned to Munich and continued to work for the military as an intelligence officer. As an army political agent in September 1919, he joined the small German Workers’ Party in Munich. In 1920 Hitler was put in charge of the party’s propaganda and left the army completely devoting himself to improving his position within the party, which in that year was renamed National Socialist German Workers’ party. During the post-war insecure years of poverty, conditions were ripe for further development of such a party. World War I ended in 1919 with the signing of the Treaty of Versailles, which was not only a military defeat, but also a psychological defeat for the German state since the German people were expecting victory. The severe peace terms of the Treaty that caused the most resentment in Germany were the loss of territory, the war guilt placed solely on Germany for starting the war, the deliberate demilitarization and the reparations demands. The Bavarian region of Germany was famous for its traditional separatism and the region’s popular dislike of the republican government in Berlin. Munich, as the Bavarian centre, was a gathering place for dissatisfied service members and soldiers that were unwilling to return to civilian life, and for political plotters against the “old” republic. Unsurprisingly, many of those groups joined the National Socialist Party, including Ernst Rohm who played a great role in furthering Hitler’s rise within the party. Rohn recruited the “strong arm” squads used by Hitler to protect himself and party meetings, to attack socialists and communists, and to exploit violence for the impression of strength of the “purified Aryan race”. In 1921, these squads were formally organized under Rohm into a private party army, called the SA. The severe conditions at the time were extremely favorable for the fast growth of the small party, and Hitler was keenly perceptive and shrewd enough as to take advantage of them. In July 1921, backed up by Ernst Rohm and supported by the vast majority of the remaining party staff, he became the party’s sole chief leader with almost unlimited power. From the very beginning, he set out to create a mass movement, whose mystique and power had to bind its members in loyalty to him. 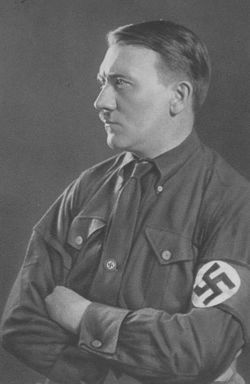 Hitler entirely devoted himself to his ideas and engaged in unrelenting propaganda through the party own newspaper called the “Popular Observer”. Hitler led regular meetings whose audiences soon grew from a handful to thousands. Moreover, the climax of the National Socialist Party's rapid growth in Bavaria came in an earnest attempt to seize the German government and political power by force. In November 1923, Hitler tried to take advantage of the prevailing confusion and opposition to the payment of war reparations to Britain and France. At a public meeting of 3000 people in Munich, he announced that the national revolution had begun and declared the formation of a new right wing government. Hitler hoped that his nationalist revolution in Bavaria would spread to the entire unsatisfied German army, which in turn would shortly bring down the government in Berlin. However, the uprising was almost immediately suppressed giving Hitler a vital lesson – his movement must achieve power by legal means. Due to his actions, Hitler was effectively sentenced to prison for the next nine months. He used the time to dictate the first volume of Mein Kampf. He sharpened his anti-Semitic and anti-Marxist beliefs in the book and laid out his plans for conquest. Hitler also developed his concept of the Fuhrer as an absolute dictator who would bring unity to German people and lead the Aryan race to world supremacy. Later, Hitler himself would accept the Fuhrer title symbolizing and expressing his power as the harsh and oppressive German absolute ruler and dictator. However, During Hitler’s absence and while in prison, the National Socialist Party fell into disrepair. After his release, Hitler faced even further difficulties that had not existed before 1923. 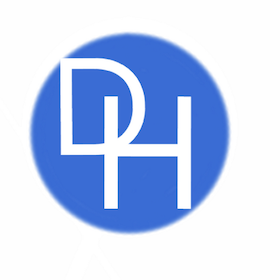 The ruling party had achieved relative economic stability and legitimized the Weimar Republic. The standard of living began to slowly improve the quality of life. Additionally, Hitler was forbidden to make public speeches, first in Bavaria, then across the entire nation. The Great Depression in 1929 brought a fresh new opportunity for Hitler and the National Socialist Party to solidify their power. In 1930, Hitler made a critical alliance with the Nationalist Alfred Hugenberg, using his newspapers to reach a nationwide audience for the first time. The union let Hitler gain financial support from business leaders who controlled political funds and were anxious to use them to establish a strong anti-socialist right wing. The funds placed the National Socialist party on a secure financial footing and enabled Hitler to attract more people from Germany's lower middle class and the unemployed by promising to end Germany’s financial troubles. He also reassured them that he sought to reassert Germany's natural greatness. For what it was worth, Hitler’s most significant achievement at the time was the establishment of a true national party, uniting people from throughout Germany under his lead. In the following 1930 general elections, the National Socialist Party won 6 million votes, making the party the second largest in Germany. Unremitting propaganda, set against the failure of the government to improve conditions during the Great Depression, produced a steadily mounting electoral strength for the National Socialists. In 1932, Hitler ran for the presidential elections but lost, yet capturing remarkable 36.8 percent of the votes on the second ballot. Finding himself already in a strong position, he entered into a series of intrigues with the conservatives: both the fear of communism and the rejection of the Social Democrats effortlessly bound them together. Moreover, Hitler insisted that the chancellorship was the only office he would accept. On January 30, 1933, already in poor health, the president Hindenburg offered Hitler the chancellorship of Germany, hoping to meet Hitler’s appetite for power. However, Hindenburg underestimated Hitler’s political audacity and failed to satisfy his main political rival making him part of the ruling party and cabinet. Instead, one of the new chancellor’s first acts was to start an intensified campaign of violence through the branches of the National Socialist Party and to exploit the burning of the Reichstag (the house of the German parliament) building as a pretext for calling new early general elections. Hitler and his party used the fire as firm “evidence” that communists were plotting against the German government. The responsibility for the Reichstag fire remains an ongoing topic of debate and research to date. However, the National Socialist Party effectively accused the Comintern of the act regardless of the official version that the working class started the fire as a protest against intolerable working conditions. Some historians even agree, as proposed by the Communist Party, that the fire was planned and ordered by Hitler as a false flag operation. Whatever the truth, Hitler used the fire to solidify their power and eliminate the communists as political rivals. Crucially, the National Socialists won the polling registering 43.9 percent of the votes. On March 23, 1933, the Enabling Bill, giving full powers to Hitler, was passed in the Reichstag by the combined votes of the National Socialists, the Nationalist and the Center party deputies. Having achieved full control over the legislative and executive branches of government, Hitler and his political allies embarked on a systematic harsh suppression of the remaining political opposition. By the end of June 1933 all non-National Socialist parties, organizations and labor unions practically ceased to exist. On July 14, 1933, Hitler’s National Socialist Party declared itself the one and only true legal political party in Germany. Hitler even purged and purified the National Socialist Party’s own SA paramilitary organization in a successful effort to win support from the official national German army. The demands of SA for more political and military power led to the Night of the Long Knives, which took place from June 30 to July 2, 1934. The Night of the Long Knives let Hitler's regime carry out a series of political extra-judicial executions. Hitler moved against the SA because he saw SA's independence and its growing free street violence as a direct threat to his newly gained political power. In addition, the new German Chancellor wanted to conciliate leaders of the official German military who feared the SA particularly for Rohm’s ambition to absorb the official army into the SA under his own leadership. Ernst Rohm and other SA leaders, along with a number of Hitler’s political enemies, conservative anti-National Socialists, even former chancellors, were rounded up and shot. Once done, nothing stood between Hitler and absolute power in Germany except 87-year-old German President Hindenburg. Hitler decided that he should succeed Hindenburg, however, not as a resident, but instead as a Fuhrer (supreme leader) of the German people. Since Hitler effectively governed the entire Reichstag, within hours after the President’s death, Hitler declared the office of President vacant. The Reichstag immediately introduced a special law to merge and combine the offices of the Reich President and the Reich Chancellor. In effect - all existing authority of the President had to be transferred to the effective Fuhrer and Reich Chancellor, Adolf Hitler. The new law was technically illegal since it violated the German Constitution concerning presidential succession as well as the Enabling Act of 1933, which forbade Hitler from altering the presidency. However, none of that did matter because the National Socialist's already exercised absolute authority. Critics of Hitler’s new regime were eliminated, and Hitler became the ultimate arbiter of the law. Adolf proclaimed and introduced himself as the Reich Chancellor, Fuhrer of all Germans and Head of state. After the President’s funeral, the National Socialists even prepared a nationwide vote giving the German people an opportunity to express their “free will” and approval of the Fuhrer’s new powers and thus legitimize Hitler’s position in the eyes of the world. On August 19, 1934, about 95 percent of registered voters in Germany went to the polls and 90 percent of them gave Hitler a positive vote. Therefore, Hitler could now officially claim himself Fuhrer of the German nation with the overwhelming approval of his people. In the end Hitler had finally triumphed achieving total control and absolute power across Germany. Hitler's rise to power was swift and brutal. He had risen for a corporal in the German army to Fuhrer in just 15 years. 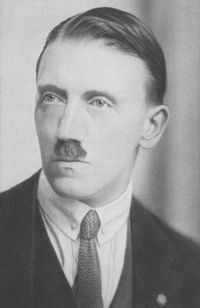 Hitler had consolidated power by uniting various nationalist factions and successfully placed himself at the head of the Nationalist Socialist Power. He used violence to fight both the opposition and purge his allies when they became inconvenient. His speeches mesmerized the Germany citizenry and successfully the public that he was more than just a ruthless thug. The early chaos of German transformed him into a prominent national voice, and the Great Depression gave him the argument that convinced Germany to follow him. Unfortunately, Hitler would lead Germany to a destructive spiral of violence, hatred, and genocide that would destroy the country and millions of lives. How did the wars of the Byzantine Emperor Justinian, change history? ↑ Also referred to as “My Struggle”, Mein Kampf is Hitler’s political autobiography as well as a compendium of his numerous ideas.